Blimey, you’d think that I’d have something interesting to write about from the last six weeks. But sadly not. The majority of my life has been consumed by work, and I don’t really want to bore you with the sundry details of pissed of customers, mountains of red tape, and piles of random management gubbins. Despite being officially a lead engineer I’m now resigned that I’ve done my last piece of actual engineer, my day to day work is all managing people, planning projects, buying equipment, and working on various initiatives. You can imagine how none of that would make a very interesting post. I tend to spend my weekends trying to catch up on sleep, doing the odd bit of work and also the odd bit of drinking. It’s still raining most days here so I haven’t even been motivated to try and go do anything touristy. The rain should ease off in a few weeks and then perhaps I can go and take some decent pictures. Until then here’s the view from my current flat especially for MasterMuir, although I’m moving out in a month or so to a different flat that mostly has a view of the roofs of the nearby buildings. It does nicely illustrate something I’ve been trying to explain about Manila, it’s mostly just sprawling one/two story buildings of various types but with big pockets of skyscrapers dotted around. 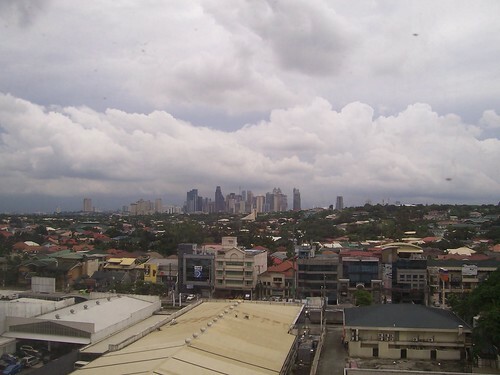 The ones you can see from my window is Ortigas Centre [map]. Anyway that’s it, I’d promise to write more soon but for all I knows it’ll be another six weeks before I manage to cobble together another meaningless post. For now I’m just going to settle back and watch the X-Factor which I’ve just downloaded (yes, I am that sad). You are currently browsing the UnorthodoxY weblog archives for September, 2009.